An S.G.C. scientist creates a computer virus to be used to disable enemy Stargates -- but succeeds in shutting down the entire gate network. “What happens is, [Felger] tests the virus, and it appears that the virus is self replicating, because in a matter of hours, the entire gate system is shut down. And you’ve got teams stranded off-world. You’ve got Daniel stranded on a planet where he was helping to relocate a civilization, and basically their planet was wracked with these seismic disturbances, heavy rains and flooding, so he’s trapped off-world. O’Neill and Teal’c were trying to broker a truce between some rival Jaffa, and basically everything went to hell in a hand basket, and he’s trapped off-world. “Okay, in retrospect the title was one of the best things about this episode. We shot Felger’s apartment at the Accent Inn across the street from The Bridge Studios (where we also shot Ronon and Sheppard watching BSG on motel TV, Teal’c enjoying the thousand finger massage in ‘Point of No Return,’ and the scene of Kinsey’s shooting in ‘Smoke and Mirrors’). In the original script, Felger is painting his Warhammer figures but the gang at Warhammer nixed the idea because they felt suggesting a character like him (i.e. brilliant scientist) played Warhammer would depict the game in an unfavorable light. So we went with Stargate action figures instead. VOTE! 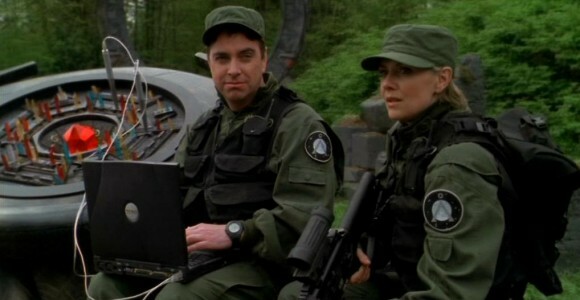 How would you rate SG-1's "Avenger 2.0?"